Here we are talking about chips, as in deep-fried potato chips, aka fries outside of the UK and Ireland. I am not talking about potato crisps - again outside the UK - known as potato chips. Confusing I know. Chips are a British institution with Brits working their way through half a billion meals containing homemade chips each year. Cut the potatoes into 1cm slices then slice these into 1cm-wide chips. Place the chips into a colander and rinse under cold running water. Place the washed and dried chips into a pan of cold water, bring to a gentle boil and simmer for 3 to 4 minutes. Then dry thoroughly with a tea cloth or kitchen paper. Heat the oil to 160 C in a deep-fat fryer or large, deep saucepan. Blanch the chips a few handfuls at a time in the fat for a couple of minutes. Do not brown them. Once they seem drier and slightly cooked remove from the fat and drain on kitchen paper. Keep covered and at room temperature until needed. Reheat the fat to 190 C and cook the chips until golden and crisp about 5 to 8 minutes. The choice of potato is important for a good chip. A floury potato is best as they have a soft, dry texture making them good for chips. Look for King Edwards, Maris Piper, Romano, Desirée, or Russet potatoes. Use a good vegetable or oil, or if you prefer a traditional flavor then use dripping or lard. Beef fat or lard produce a full flavored chip and, if cooked properly, the chip will be crisp and brown on the outside and soft within. Chips cooked with vegetable oils do create a similar chip, but have less flavor and less cholesterol. 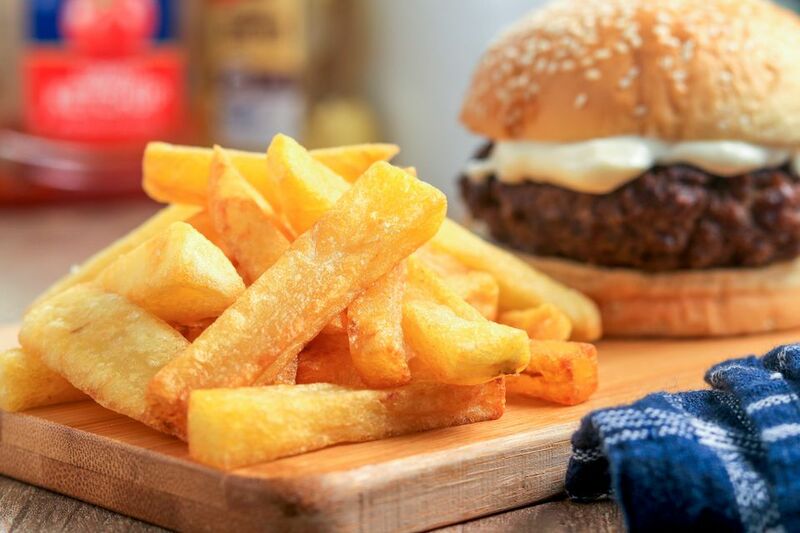 Thick chips absorb less oil than thin ones, making chunkier chips healthier. 5 Steps toTraditional English Muffins, Easy.